What Does a Wrist Sprain Feel Like? What's the Treatment for a Wrist Sprain? When Will I Feel Better After a Wrist Sprain? How Can I Prevent a Wrist Sprain? A wrist sprain is a common injury for all sorts of athletes. All it takes is a momentary loss of balance. As you slip, you automatically stick your hand out to break your fall. But once your hand hits the ground, the force of impact bends it back toward your forearm. This can stretch the ligaments that connect the wrist and hand bones a little too far. The result is tiny tears or -- even worse -- a complete break to the ligament. Practice stretching and strengthening exercises if your doctor recommends them. It is best if you see a physical or occupational therapist to guide a program specific to your condition. More severe Grade III wrist sprains, in which the ligament is snapped, may require surgery to repair. Recovery time depends on how serious your wrist sprain is. These injuries may take from two to 10 weeks to heal. But that's a rough estimate. Everyone heals at a different rate. While you heal, you might want to take up a new activity that won't irritate your wrist. For instance, skiers could put down their poles and try jogging or stationary biking. Your injured wrist, as well as the hand and arm on that side, feel as strong as the uninjured wrist, hand, and arm. If you start using your wrist before it's healed, you could cause permanent damage. 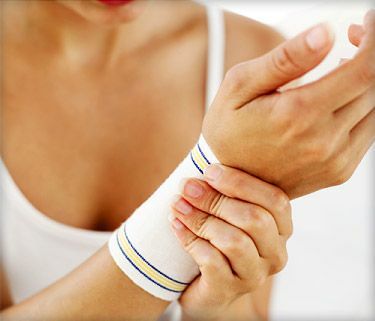 Wrist sprains are hard to prevent, since they're usually caused by accidents. Even the best-trained athlete can slip. But always make an effort to exercise safely. Some athletes benefit from using wrist guards or tape. These may prevent the wrist from bending backward during a fall. American Academy of Orthopedic Surgeons web site: "Wrist Sprains." Davis, M.F., et al, Expert Guide to Sports Medicine, American College of Physicians Press, 2005. Rouzier, P., The Sports Medicine Patient Advisor, second edition, SportsMed Press, 2004.